The revolutionary JP104 offers Jupiter’s new amazing infrared filter system for maximum purity, energization and filtration ability. You can also attach your Jupiter Melody to a mains pressure inlet and control water flow from the Melody instead of from the tap. this system has been the undisputed “Rolls” of water purifying systems for over two years. Post cleaning for perfect water always. First model to always gives alkaline water – even when cleaning! This feature also in Orion and Aquarius. ~ Why? Four levels of alkaline water. ~Why? Four levels of acid water. ~Why? 9-stage filtration with BioStone Infrared technology – 0.01M option available ~ Why? 5-plate latest technology polymer ion plated platinum coated titanium ionizing plates (est. life 20 yrs, latest Japanese University technology) ~ Why? Stainless steel output spout ~ Why? Integrated MICOM computer circuitry throughout ~Why? Unique post-operation automatic, silent cleansing for extended lifespan ~ Why? Voice confirmation every time you choose another output pH ~ Why? Filter usage Liquid Crystal display indicator ~ Why? Optional ability to connect direct to mains and operate under mains pressure ~ Why? 1/4 inlet tube; better visually in your kitchen that the 3/8″ tube on other models. ~ Why? Liquid Crystal Display that changes color to match the pH of the water selected and with low flow indicator, plus hot water and low flow alarms. Optional Undersink kit available – chrome or brushed chrome. stylish upright look, great filtration, great range of output, ease of operation and installation. And the pedigree and security of dealing with Korea’s largest and longest established water ionizer manufacturer. tell us what any other model has that this doesn’t. We guarantee top value and lowest price. Then add on the security of investing in the firm that manufactures 90% of all ionizers sold in or exported from Korea, AND manufactures major components for other electronic ionizers sold in the USA, and you’ll know the way to go is to get with the strength and the experience. 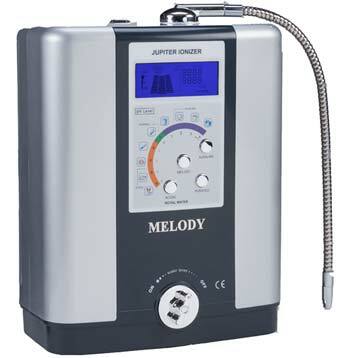 The Jupiter Melody Water Ionizer is Jupiter Science’s (and the world’s) most popular model. It is the first Water Ionizer in the world that has BioStone, which naturally generates negative ions as soon as it makes contact with water. It activates water to assist in support of metabolism, and circulation. It can also assist with skin issues and makes drinking water easier. In addition, Tourmaline generates FIR that improves the energy level of water. It acts like a ‘supercharger’, assisting the water alkalizer to ionize and alkalize. Tourmaline has an immediate and powerful effect on water in the filter. Surfactant effect (makes water wetter) increases by around 100%. Tourmaline has been researched and found to activate animal & plant metabolism. Jupiter Science has patented this very latest polymer ion separation technology. This technology helps to make Jupiter Science ionizers capable of the best range of pH and negative antioxidant ions of any system, making this unit at least comparable to any Water Ionizer on the market – REGARDLESS of price. It easily outperforms Japanese imports, which have been perceived as the best for many years. However, led by Jupiter Science International, Korean manufacturing standards rose sharply in the 1990s to challenge Japanese quality. Jupiter Science has now surpassed Japanese quality and set a new standard which Japanese manufacturers are now trying their best to mimic. The Jupiter Melody is also the first water purifier, in the world, to always give alkaline water – even when it is in cleaning mode. With 9 levels to choose from, the ideal personal ionization level is immediately obtained. The JP104 ‘Melody’ comes with a faucet diverter and is easily installed in minutes to any sink. It also has a built-in flow control on the front panel so it can be installed directly to the water source; one of the few water ionizers to offer this.